Karamba was first established as an Online Casino in 2005 and their popularity started to increase due to the success they were enduring. Karamba were doing great with their Online Casino, so because of this, they decided to launch the Karamba Sportsbook in 2017 and the App was launched soon after. Within just a few months, the Karamba Sportsbook and App started to boom in business and thousands of new punters were signing up! We have decided to form this Karamba App review in order to give you all the relevant information you need to know about the Karamba Bet App. The Karamba Bet mobile app is comes across as well developed and it is very different from the majority of Betting apps out there. The main colours that are used on the app are blue and silver which do look good together as they contrast well, in addition to this there are other colours too, these include pink, yellow and blue which are all in different places on the app. In terms of app features, the Karamba Bet app does have quite a few good features which make the app better in my opinion. First of all, the app itself has a brilliant range of payment methods for users to choose from. This is a good feature to have as it shows that Karamba Bet can cater for different types of punters who use various methods of payment. Another useful feature about the Karamba Bet app is the fact that the app is fast to load up and it is also extremely easy to navigate too. Third of all, I am a big fan of the instant win games that Karamba Bet offer to their punters, this is good to see as not all sites have these types of games and personally, I think they should as they are very popular with punters, so it is good to know that Karamba Bet offer them. As you may already be aware of, Football is by far the biggest sport in the world and it is even bigger in terms of online gambling! The popularity in Football in the online gambling industry has been huge for several years now and it is the most betted on sport in the world. In 2018 it was announced that over £450 billion was wagered on Football in the United Kingdom. Luckily for Football betting fans, Karamba Bet offer a great range of Football betting to their punters and it is something that they are quite well-known for. Karamba Bet are a safe company with a secure app, so you can be sure to feel comfortable when betting on Football with them. There are so many options and choices to select from in terms of Football betting when using Karamba Bet. Once you enter the Karamba Bet app you will instantly see the Football option, once you have clicked on this then all the teams, fixtures, events, odds and types of bets are displayed. Some of the most popular types of Football bets that Karamba Bet offer to their users are, Accumulator, Double Chance, Handicap, Outright Betting and Specials. Horse Racing has been a pioneer in the world of online betting for a number of years now, and each year there is huge amounts of money that is placed on Horse Racing betting due to all the prestige competitions and events that take place. These events see huge crowds and millions of people across the world tune in to see if their favourite Horse will win a race! The Karamba Bet app is extremely well developed in every sector and this includes the Horse Racing sector too. There are many options for the user to choose from once on the app and as soon as they click on the Horse Racing category they will be taken to a page where all the Horses, Odds, Jockeys, Live Results and Events are shown. Once the user is on the Horse Racing page, they will see all of the upcoming events that have occurred and also those that will be occurring. Some of the most popular ones are, Cheltenham Festival, Scottish Grand National and the Welsh Grand National. In my opinion, Karamba Bet have done a good job in terms of their Horse Racing section as it is informative to users, well displayed and is also easy to navigate. In-Play Betting has become extremely popular in the last few years and it is certainly fair to say that it is a key feature when it comes to Online Betting. Just like the majority of other highly rated Online Betting apps, Karamba Bet offer the In Play feature on their app too. The In-Play feature can be found on the left side of the app and once the user has clicked on it they will be taken to a page which will show all the In-Play events that the user will be able to bet on. Online Bettors love to win money and that is obviously why they bet. Cashing Out allows the user to opt out of a bet before the match has finished and take away some money instead of losing. The majority of players who cash out do it because they feel the event that they are betting on may take a turn and therefore it may affect their bet and possibly result in them losing their bet so they would rather cash out and take some money instead of seeing the match finish and have 0 winnings. 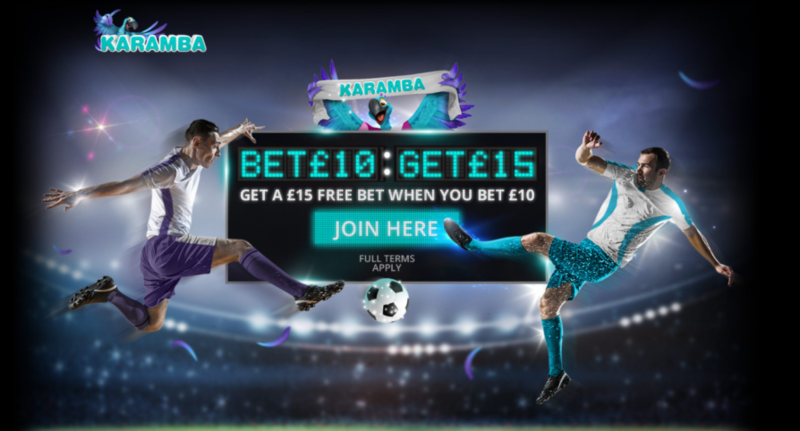 Karamba Bet offer this magnificent feature to their punters and it can be found on the home page of the app or even once the user has placed a bet, the cash out button may appear at the bottom of the bet sheet if the bet is eligible. Downloading the Karamba Bet app is very simple and it is free to download too! For those on an iOS device, you will need to head to the app store and type in ‘karamba bet’ and click the download button and for those on Android, you will need to do the same but search for it on the Play Store. Alternatively, you can download the app straight from the website. The Karamba Bet app really is one of the best betting apps that I have seen in a long time. The app is modern, fresh and extremely exciting. The Karamba Bet app is also free to download which is great and I am also a big fan of the way it has been developed and also of the features that it offers. The graphics have been executed brilliantly and they are very clear, the images are crisp and the colours that have been used work very well with each other. In addition to this, the offers that are available to punters is another brilliant feature too. If you would like a new betting app which has some great offers and fantastic features, then you need to download the Karamba Bet app!